There are very few friendships that are as beautiful and chaotic as the one between Gauguin and Van Gogh. This is a portrait of Gauguin that quite possibly could’ve been drawn without his knowledge. 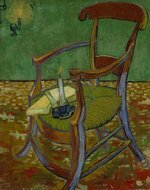 Van Gogh’s relationship with Paul Gauguin, his housemate in Arles, is a fascinating story that has documented gorgeously in Van Gogh’s letters to his brother Theo. This simple portrait of Gauguin is symbolic of his love and appreciation of Gauguin as a person and an artist. 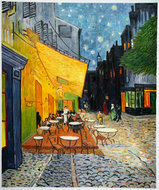 Our experienced artists have painstakingly studied Van Gogh’s approach to his paintings, especially his portraits. Keeping his brushstrokes, colour palette, and perspective in mind, they can create a stunning replica of Man In A Red Beret just for you. Vincent van Gogh once remarked that he ‘tries to express the terrible passions of humanity by means of using red and green.’ His torrid relationship with Gauguin reached an almost irreparable when he approached Gauguin with a knife in his hand. Gauguin managed to diffuse the situation, however, he was terribly sad and left the house they shared. 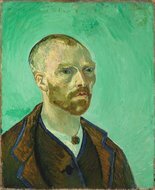 Van Gogh, coming to terms with what just happened, was overcome by emotion (he was also rumored to be suffering from depression), and ended up cutting off his own ear. After doing so, he apparently walked into a brothel, asked for a woman named Rachel, who worked there as a maid, and deposited the severed ear in her hand. 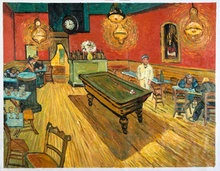 This would also be the last time that Gauguin and Van Gogh would ever come face to face. The way Van Gogh painted this piece, it can be said that he was becoming more and more cautious of Gauguin as their relationship deteriorated gradually. This portrait can almost be described as awkward. 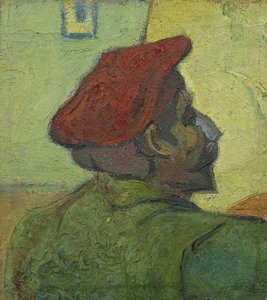 The nose is highly pronounced, even though the perspective of the portrait is from behind Gauguin’s back. This could be Van Gogh’s way of portraying Gauguin’s headstrong and stubborn nature. In fact, Gauguin had also painted a portrait of Van Gogh while he painted sunflowers. Gauguin represented Van Gogh’s face with a spaced-out look in his eyes, almost as it he was trying to hint that Van Gogh had lost touch with reality.